Over the last five years, the fatal occupational injury rate in NY State increased by 29% while it decreased by 21.3% in New York City. Up until 2014 it was more dangerous to be a construction worker in the city than to be a construction worker somewhere else in New York State. 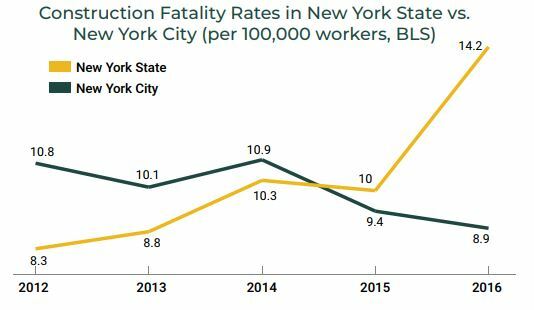 Things have changed since 2015 when the construction fatality rate for New York State reached 10 fatalities per 100,000 workers while the same rate was 9.4 in New York City. The following year the New York State fatality rate for construction workers jumped to 14.2 while the city fatality rate declined to 8.9. According to “Deadly Skyline” the annual report released by the New York Committee for Occupational Safety & Health (NYCOSH), these numbers are painting a sad reality for New York State. While in New York City, the Department of Buildings has been drastically increasing its resources and budget over the last few years to face the construction boom, the Occupational Safety and Health Administration (OSHA) continues to be systematically underfunded and can’t keep up with the increase in new construction projects in the State. The number of construction worker deaths in New York State increased from 50 to 71 between 2014 and 2016 while the number of construction worker deaths in New York City declined from 28 to 21 during the same period. Most construction accident deaths are preventable. Despite New York State’s Scaffold Safety Law that holds building site owners and employers fully liable for worker injuries and deaths caused by falls from an elevation, almost half of the deaths are the results of a fall in New York City and in New York State. The other common causes of deaths in NY and NYC construction sites are electrocution, struck by object and caught in or between equipment or machinery. If it were not for the Scaffold Law, deaths would certainly increase. Thus, efforts to repeal it or modify it should be rejected. In both New York Sate and New York City, most construction workers who died on the job were working on non unionized construction sites. In NY State 94.7% of those who died in 2016 were non unionized, in NYC 93,8%. While unionized sites emphasize workers safety and workers training, non unionized sites often choose profit before safety. In New York City, District Attorneys recently started to prosecute contractors who needlessly endanger employees’ lives like criminals. Manhattan DA Cyril Vance convicted Harco Construction and Sky Materials for the death of Carlos Moncayo (see previous blog). However existing NY criminal law does not go far enough and Harco Construction ended paying only $10,000 for its crime. Construction workers advocates are now asking NY State to pass Carlos’Law, a law that would create real penalties for contractors who recklessly caused a worker to die on the job. Additionally Bill de Blasio recently signed a new bill requiring every construction worker to attend a 40-hour minimum safety training to be able to work on a construction site in the city. By March this year every worker is supposed to have completed at lest 10 hours of training. By December every worker is supposed to have completed 20 hours. By May 1st 2019 every construction worker in New York City will need have completed 40 hours of safety training to be able to work. A similar training safety requirement would protect NY State construction workers as well. Unfortunately there is no equivalent to the NYC Department of Buildings at State level and OSHA is in a state of decimation. 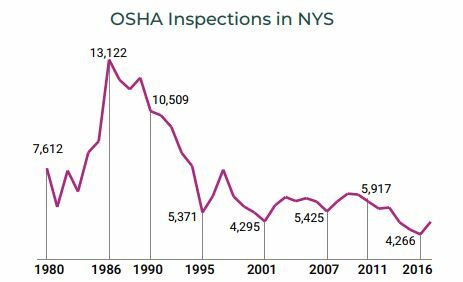 There was a time in the 80ies when OSHA was running more than 10,000 inspections every year in New York Sate but this time is well past. In 2016, OSHA ran 4266 inspections in New York State. Since 2010, the OSHA budget has remained stagnant and is not expected to increase under the present administration. Additionally , OSHA has significantly reduced the number of press releases on safety and health violators. In Region 2, which New York State is part of, the number of press releases went from 58 in 2016 to 11 in 2017.